When Disney decided to create “direct-to-video” (DTV) sequels to classics like Bambi and Cinderella, this offended serious some fans, but at least it made sense from a commercial sense. On the other hand, The Fox and the Hound 2 - the 2006 sequel to the 1981 original - seems unlikely to upset any Disney buffs, but I think it’s an odd choice from a monetary sense. The first flick isn’t exactly a highly-regarded classic, so does anyone actually want to see more from its characters? Probably not, but I’ll give it a look anyway. Fox 2 revisits the story of improbable pals Copper (voiced by Harrison Fahn) the dog and Tod (Jonah Bobo) the fox. It doesn’t pick up where the first film left the critters as adults. Instead, it’s more of a “midquel” that spends time with the animals as youngsters. Copper feels like a failure as a puppy since he can’t seem to do anything right. His constant blunders leave him depressed despite Tod’s attempts to elevate his spirits. When they steal off to the county fair, they encounter a musical group called Lyle Snotgrass and the Singin’ Strays. The croonin’ pooches enchant Copper, and he gets to sing on stage with them. He steals the show and earns an invite into the band from leader Cash (Patrick Swayze). This doesn’t sit well with prima donna Dixie (Reba McEntire), though, and she tries to sabotage Copper’s success. The movie follows his adventures with the band as well as the complications that forms in his friendship with Tod. One good thing about Disney’s DTV sequels to forgettable movies: they can only fall so far. If you try to extend a classic like Cinderella or Beauty and the Beast, you end up with a product that almost inevitably does little more than sully the original flick’s reputation. However, a sequel to a mediocre film doesn’t encounter the same concerns. If Fox 2 were a total dud, so what? The original was so bland and forgettable that as long as the sequel kept me awake, it’d be a success. I did manage to stay conscious during Fox 2, and I even found a little fun along the way. Make no mistake: this is a slight production. It provides a thin story that serves as little more than an excuse for the “don’t screw with your friends” moral as well as some tunes and sight gags. The characterizations are one-dimensional at best, and the elements remain consistently predictable. That said, Fox 2 musters a sense of fun that allows it to succeed. Unlike most Disney DTV sequels, it doesn’t just retell the original flick’s story, and in this case, the plot is superior to that of its predecessor. Granted, that’s not hard to do since Fox lacked much of a narrative, but it comes as a pleasant surprise to find a plot that attempts to step out on its own and not just regurgitate elements from the earlier film. A nice vocal cast also contributes to the moderate success of Fox 2. Patrick Swayze and Reba McEntire aren’t exactly “A”-list actors, but they bring their “A” games. They never give the impression they’re “slumming” in the roles, and they add life to the proceedings. All the others work nicely too, and this leaves us with a satisfying set of performances. 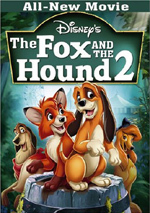 No one will mistake The Fox and the Hound 2 for a classic, and maybe it’s not even good in an objective sense. As I mentioned, I never cared for its predecessor, so I expected little from it. However, I enjoyed the time I spent with it and think it’s more entertaining and engaging than anyone could anticipate. 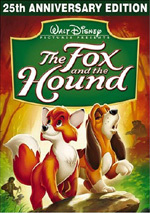 The Fox and the Hound 2 appears in an aspect ratio of approximately 1.78:1 on this single-sided, double-layered DVD; the image has been enhanced for 16X9 televisions. From start to finish, this presentation looked excellent. Sharpness appeared terrific at all times. I never witnessed any hints of softness or haziness as the movie always seemed crisp and detailed. No jagged edges or moiré effects appeared, and I saw no edge enhancement. Print flaws were absent as well; the film seemed clean and fresh. Fox used a natural, outdoorsy color design, and the gentle hues seemed well-reproduced. It’s a quiet but broad palette that looked smooth and vivid at all times. Black levels were deep and rich while shadow detail seemed appropriately dark but never excessively heavy. Ultimately, the DVD presented a very satisfying visual experience. To my surprise, Fox includes both Dolby Digital 5.1 and DTS 5.1 soundtracks. The two mixes seemed virtually identical to me. Across the front channels, the sound presented a fairly broad array. Music displayed nice stereo imaging, and elements meshed together well. A fair amount of effects popped up from the sides and movement flowed cleanly. The surrounds added a surprising amount of material as well. Material often popped up from the back speakers, and the components were accurately placed. The whole package blended together to create a strong little soundscape. Audio quality appeared fine but unexceptional. Dialogue always seemed crisp and natural with no signs of edginess or problems related to intelligibility. Effects were clean and realistic, and when appropriate, they showed some decent dynamics. Music could have provided more depth to its low end, but the score and songs sounded clear and bright. This was a pretty solid piece of audio. A few extras fill out the package. A music video for “You Know I Will” by Lucas Grabeel goes for three minutes, 36 seconds. It combines shots of Grabeel in the studio along with movie clips. Actually, it tries to be cute in that it portrays Grabeel in a number of jobs during the production. That’s a minor attempt to create something clever in an otherwise totally forgettable tune and video. Under “Games and Activities”, we get two elements. Mutt Mix Master purports to allow us to create our own mix of a tune. However, it actually just lets us pick if we want to hear the final track, an instrumental, or the dogs on their own. It’s a dull extra. 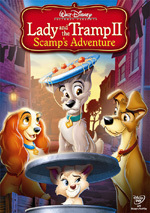 We also find a playable demo of Disney DVD Game World: Disney Dogs Edition. This is a contest that asks questions and involves other challenges as part of a DVD boardgame. It’s here essentially as a tease to get us to buy the full game, but it seems fun. The Making of the Music: The Fox and the Hound 2 runs 10 minutes, nine seconds. 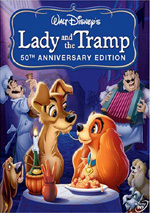 It features notes from Grabeel, director Jim Kammerud, music supervisor Kimberly Oliver, Disney Toon Studios Senior VP of Music Matt Walker, composers Marcus Hummon, Joel McNeely, Will Robinson and Gordon Kennedy, musicians Trisha Yearwood, Karen Fairchild and Josh Gracin, and actors Reba McEntire and Jeff Foxworthy. We hear how the filmmakers went to Nashville and found songwriters for the flick. We also get notes about the composition and recording of some tunes as well as the score. Though the show provides a smattering of interesting notes, it remains too superficial to offer much. A classic short called Goofy and Wilbur lasts eight minutes, nine seconds. From 1939, the cartoon presents Goofy’s first lead role. As seen in “Wilbur”, Goofy behaves almost exactly the way I expect based on prior co-starring shorts. A gently entertaining cartoon, Goofy actually still seems to play a supporting role, as the flick emphasizes Wilbur the grasshopper. This makes it mildly amusing but it seems like less than an auspicious debut as a lead actor. The DVD opens with a few ads. We get clips for Peter Pan, Meet the Robinsons, AirBuddies and Cinderella III: A Twist in Time. These also appear in the Sneak Peeks area along with promos for Little Einsteins: The Legend of the Golden Pyramid, Tinker Bell, Enchanted Tales: A Kingdom of Kindness, My Friends Tigger and Pooh, and The Little Mermaid III. I really can’t wait for the theatrical release of Robinsons, as I’m tremendously sick of that trailer – it’s on virtually every Disney DVD! Perhaps my enjoyment of The Fox and the Hound 2 stems from my lack of affection for its predecessor, or maybe it’s just a decent little flick. Whatever the case, I think the sequel provides a peppy and innocuous piece of fun. The DVD offers excellent picture and strong sound but throws in only a few inconsequential extras. There’s not enough here to warrant a strong recommendation – especially with the DVD’s $29.99 list price – but this title at least deserves a rental for families.